Amplify your Indian look with this amazing piece of necklace set that comes with matching earrings from the house of Craftsvilla and look absolutely stunning. 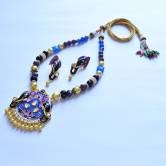 Made of the best quality material this completes your look.This beautiful meenakari necklace is baesd on a round and black elephant temple embellished pendant with delicate handwork of meenakari and kundan stones The rest of the string of necklace is decorated using meenakari / enameled balls, cutting solid color balls and golden separators. 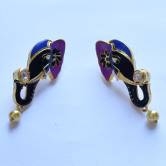 The earrings are based on meenakari / enameled balls crowned using cutting solid color balls.It will fetch you endless compliments for your traditional choice.